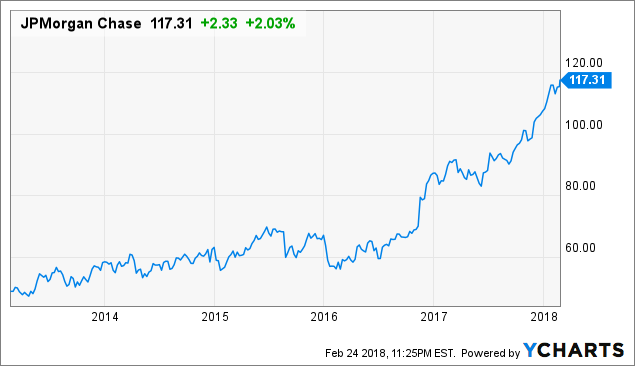 Company Profile (obtained from Marketwatch): JPMorgan Chase & Co. is a financial holding company, which provides financial and investment banking services. It offers a range of investment banking products and services in all capital markets, including advising on corporate strategy and structure; capital raising in equity and debt markets; sophisticated risk management; market making in cash securities and derivative instruments; and prime brokerage and research. It also offers investment banking, financial services for consumers, small business and commercial banking, financial transaction processing, asset management and private equity. The company operates its business through the following segments: Consumer and Community Banking; Corporate and Investment Bank; Commercial Banking; and Asset & Wealth Management. The Consumer and Community Banking segment serves consumers and businesses through personal service at bank branches and through automated teller machine, online, mobile, and telephone banking. It is organized into Consumer and Business Banking, Mortgage Banking and Card, Merchant Services and Auto Card. The segment’s Consumer and Business banking offers deposit and investment products and services to consumers, and lending, deposit, and cash management and payment solutions to small businesses; Mortgage Banking includes mortgage origination and servicing activities, as well as portfolios comprised of residential mortgages and home equity loans, including the purchased credit impaired portfolio acquired in the Washington Mutual transaction; and Auto Card issues credit cards to consumers and small businesses, provides payment services to corporate and public sector clients through its commercial card products, offers payment processing services to merchants, and provides auto and student loan services. The Corporate and Investment Bank segment offers a suite of investment banking, market-making, prime brokerage, and treasury and securities products and services to a global client base of corporations, investors, financial institutions, government and municipal entities. It offers a range of investment banking products and services in all capital markets, including advising on corporate strategy and structure, capital-raising in equity and debt markets, as well as loan origination and syndication. The Commercial Banking segment delivers industry knowledge, local expertise and dedicated service to United States and its multinational clients, including corporations, municipalities, financial institutions, and non profit entities. This segment provides financing to real estate investors and owners as well as financial solutions, including lending, treasury services, investment banking, and asset management to meet its client’s domestic and international financial needs. The Asset & Wealth Management segment provides asset and wealth management services. It offers investment management across all major asset services, including equities, fixed income, alternatives, and money market funds. JPMorgan Chase was founded in 1968 and is headquartered in New York, NY. JPMorgan Chase & Co. qualifies for both the Defensive Investor and the Enterprising Investor. In fact, the company meets all of the requirements of both investor types, a rare accomplishment indicative of the company’s strong financial position . The Enterprising Investor has no initial concerns. As a result, all value investors following the ModernGraham approach should feel comfortable proceeding with the analysis. 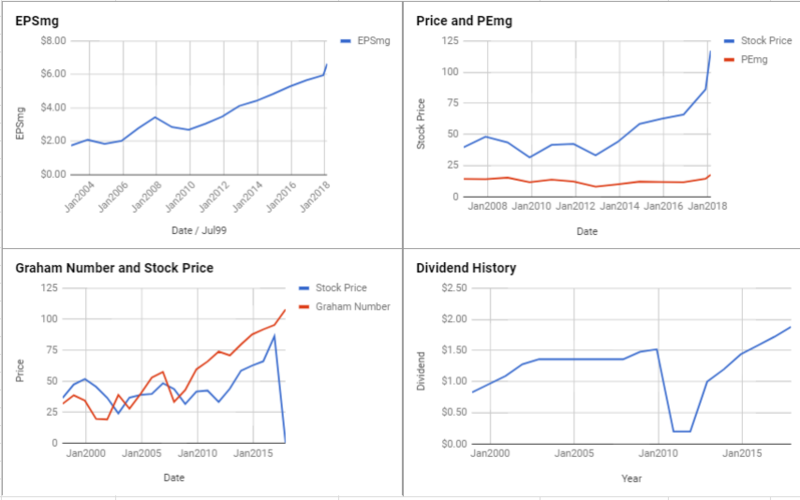 As for a valuation, the company appears to be Fairly Valued after growing its EPSmg (normalized earnings) from $4.82 in 2014 to an estimated $6.65 for 2018. This level of demonstrated earnings growth supports the market’s implied estimate of 4.57% annual earnings growth over the next 7-10 years. 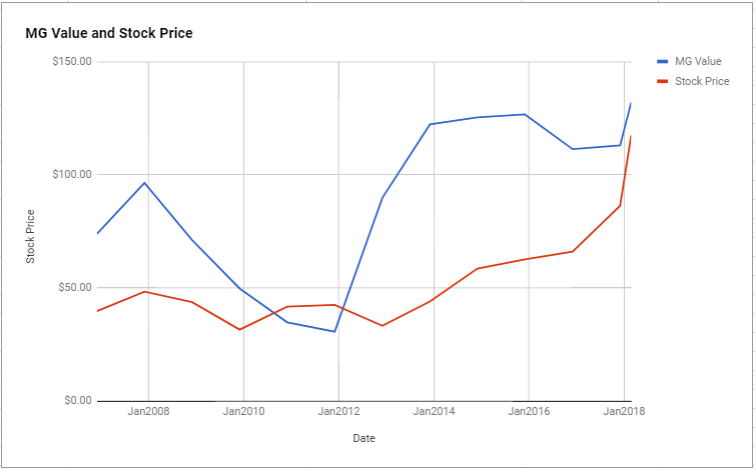 As a result, the ModernGraham valuation model, based on Benjamin Graham’s formula, returns an estimate of intrinsic value within a margin of safety relative to the price. At the time of valuation, further research into JPMorgan Chase & Co. revealed the company was trading above its Graham Number of $107.91. The company pays a dividend of $2.12 per share, for a yield of 1.8% Its PEmg (price over earnings per share – ModernGraham) was 17.65, which was below the industry average of 20.84, which by some methods of valuation makes it one of the most undervalued stocks in its industry. JPMorgan Chase & Co. receives an average overall rating in the ModernGraham grading system, scoring a C+.